At 10 p.m., when most residents are navigating their way back home, Alade Market in Shomolu, a suburb of Lagos, Nigeria’s commercial nerve centre, is just beginning to get into full swing. Improvised kerosene lamps made from tin light up the night. Trading spills over from the rows of shops and wooden kiosks, displaying clothes, kitchen utensils, fruit, vegetables, fish and meat, which line Market Road. There’s no room for cars, with only rickshaws and bikes able to weave through the maze. Ten days ago the market was empty. So were the streets, shops, schools and banks. The city shut down for a week of strikes and protests after the government abruptly announced on January 1 that it was removing a fuel subsidy, sending the price of petrol from N65 (US$0.41) to N141 (US$0.88) overnight. The money it saved, said President Goodluck Jonathan — up to US$7.9 billion — would be used to revamp crumbling power plants, repair potholed roads and improve health and education. But as fuel prices doubled, so too did the cost of goods and transport. Nigerians took to the streets in the biggest protest in decades. On January 16 the government backed down, reinstating part of the subsidy, and life has slowly returned to normal. Over the din of the market the market women call out “happy subsidy” to their neighbours and customers — a newfound greeting that has started up since the fuel subsidy removal. 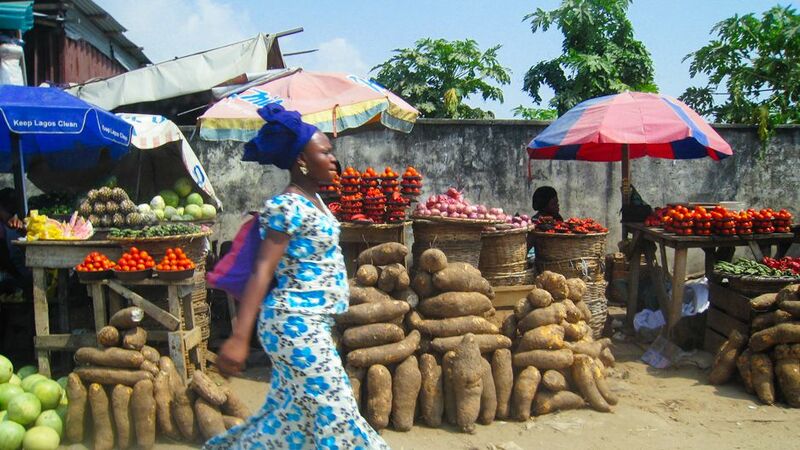 But the business as usual atmosphere at Alade Market belies the reality in some other parts of Lagos, where army troops, drafted in to quell the protests now patrol the streets, to the discomfort of many inhabitants. And the root causes behind people’s outrage — and the reasons why the subsidy is unsustainable — remain. Odutuyo Muibat, a 32-year-old trader and mother of two has lined up her wares, including melon, dried fish and ground pepper. Muibat has been in the business for 25 years, since she was a little girl. Muibat finds herself stuck in the middle, with wholesale and transport prices going up on one side she has no choice to but raise her own. But despite the reduction in fuel prices, costs have not come down. “As I speak to you, nothing has changed,” says Muibat. “Prices have remained at the point they rose to. Also, since the subsidy was removed, we had to stop buying fuel to power our small Tiger generator at home because it was too expensive. Many economists argue that the subsidy should be dropped because it was wasteful and open to corruption. Last year alone the government spent £5 billion (US$7.9 billion) — more than the budget for health, education and agriculture combined. Most of this money, analysts say, goes to the petrol importing cartels which smuggle the oil back out of the country and sell it on at a huge profit. But Nigerians, who see cheap fuel as the one benefit the government provides, say their leaders should work harder to counter the corruption first. The country is still extremely poor, despite its oil wealth. According to Amnesty International 70% of the six million people in the Niger River Delta, where the country’s oil comes from, live off of less than $1 per day. Some Nigerians, admittedly a minority, see the removal of the subsidy as a painful pill that must be swallowed if the country is to improve its infrastructure and pull itself out of poverty. The irony is that Nigeria should not have to subsidise fuel. Producing more than 2 million barrels a day, Nigeria is the sixth biggest oil producing country in the world. Yet due to corruption and poor management, it is unable to refine the oil locally. And the subsidy system discourages investment in refineries. Jeremiah Okoko holds sway as Director of the Foreign Barber Shop located on dusty Akinwunmi Street in the crime-infested suburb of Bariga. The loud droning sound of a Tigmax generator, puffing white smoke from its exhaust, welcomes the visitor. His salon virtually runs on generators, so the removal of subsidy has precipitated higher costs for his business. Electricity supply here is near non-existent, such that any time lights bulbs switch on, there’s a roar of “Up NEPA!” in fleeting praise of National Electric Power Authority (NEPA) now known as the Power Holding Company of Nigeria (PHCN). As a result of the subsidy reduction, Okoko has cut down on how often he runs his generator at home. From Melon to Haircuts, Prices Rise for Nigerians by Armsfree Onomo Ajanaku is licensed under a Creative Commons Attribution-NonCommercial-ShareAlike 2.0 UK: England & Wales License. Based on a work at http://panos.org.uk/features/from-melon-to-haircuts-prices-rise-for-nigerians/. Armsfree Onomo Ajanaku works as a features writer with The Guardian, the acclaimed flagship of the Nigerian press. Since 2006 he has covered issues of the environment, development and the infrastructural challenges in different parts of the country.